The Christian Family lived at Milntown from at least the early 16th century and parts of the house date from that period. During the seventeenth century extensive alterations and additions were made. After this period the Christians moved to Cumberland and let the house out to tenants, but in 1830 Deemster John Christian returned to live in Milntown after having the mansion house redesigned, much of which is as appears today and as shown in this photo. Following the death of William Bell Christian in 1886, the house was run first as a private school by his widow, Vio, and their two daughters, Rita and May; and then as a hotel. It reverted to being a family home when Charles Peel Yates (of Yates’ Wine Lodges) bought it in 1947. The interior of the house is as decorated and furnished by Lady Edwards and her son Sir Clive prior to his death in 1999 but there are still many features dating from Deemster Christian’s 1830 refurbishment and earlier periods. The front of the house includes the coats of arms of The Christian Family and that of Sir Clive Edwards and is in the Gothic Revival style and dates from the early 1830s. 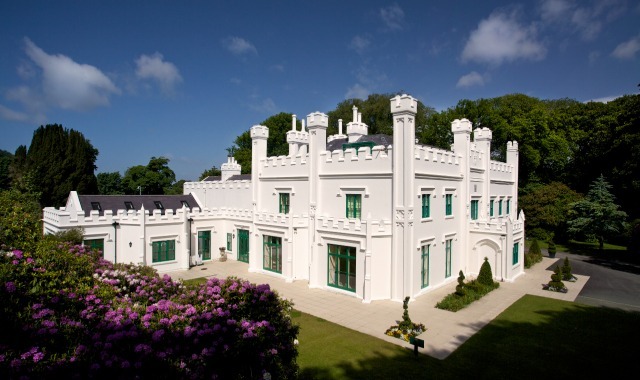 The Milntown House is open for house tours every Wednesday and Saturday at 2.30pm from 1st March - 30th September (excluding MGP and TT race weeks) @ £7 per person. Booking is highly recommended as places are limited. Private House Tours for 15+ individuals can be booked upon request, please call 01624 812321 for further details and to book.